waking and dream by Glenn G. Coats. Winchester, VA: Red Moon Press, 2017. RRP: $15. Pb, 128pp. ISBN 978-1-936848-82-9. Fishing plays a prominent (though not exclusive) role in this collection: in cold weather and hot weather, from shore and afloat, with rod and spear and seine net. Used as a context and a metaphor, fishing is portrayed as both a way of life and a way of looking at life — as much a worldview as it is a sport or pastime. Readers will find themselves among these pages even if they have never hooked a fish, though, because at its core waking and dream is about rites of passage, stages of life, and emotions common to the human experience. Along the way, readers will meet family members galore, as well as minor yet memorable characters such as a dance partner named Fay, the enigmatic Johnny Fastback, and a trespassing fisherman who is known only by his footprints. Each haibun in this book includes between one and eight haiku. 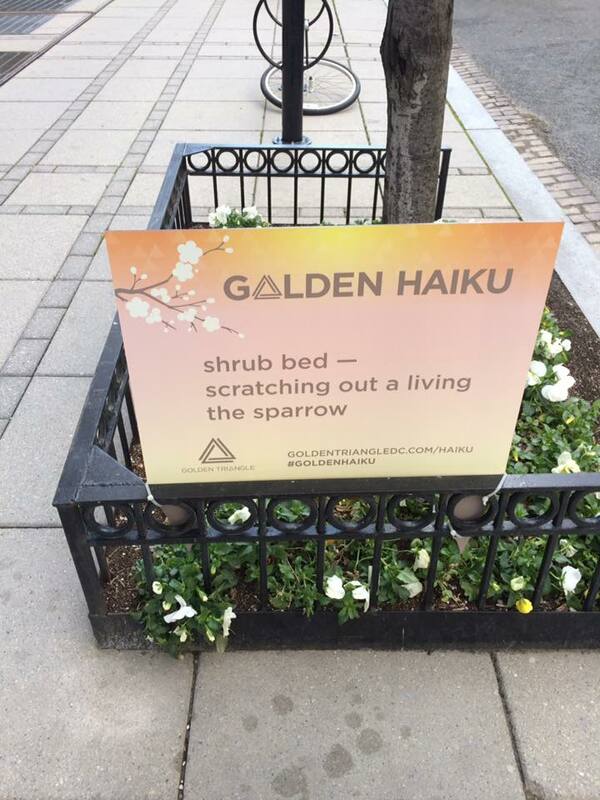 As for haiku placement, the majority come at the end of the piece, as is common—but with a twist. 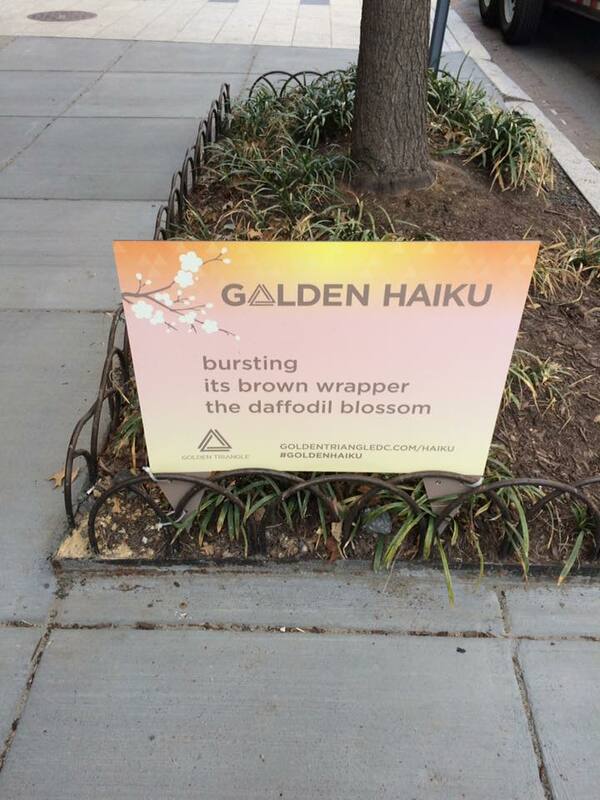 In nearly two dozen instances, not one but a pair of haiku end the haibun, encouraging two ways of reading those pieces: the haiku can be considered sequentially, with the second playing off the first, or in an “either/or” fashion in which readers can choose their own ending, so to speak. Whether or not this is intentional on the author’s part, it’s thought-provoking and fun. That night, I thought about the man who came to talk to my father at the dock; how easily my father spoke to strangers. The man who introduced himself as Jim kept a boat a dozen slips away from my father’s. He had grown up near the marshes, had fished and raked clams all his life. Jim knew how to catch snapper blues and he threw anything silver into the bay and the blues could not resist. He caught gar and kingfish which belonged farther south in the Carolinas; hoisted eels onto the pier that were thick and long as his arms. The man was twenty-eight years old and engaged to a girl who could row a boat fast as any man, knew how to work a crab trap and swam for long distances under water. It seemed like Jim had lived a long full life and I prayed to God that I too would live until I was twenty-eight. It seemed long enough at that moment. Not only does the second haiku complement the first haiku, creating a diptych of sorts, but each haiku also could serve on its own to put a different spin on the prose part. Another intriguing feature of this collection is that a dozen of the haibun substitute free verse for the prose portion, offering readers a somewhat different way to enter into the narrative. Line breaks are used in this piece to create a powerful stop-action effect — “vines / spinning through / window frames” — as well as to add dramatic emphasis: “he’d say ‘Harrow it / under.’” Impressions like these could not be communicated with such economy using prose. A captivating compilation of haibun, waking and dream will resonate with anglers and non-anglers alike because across 78 pieces this book tells a story all people can relate to: the story of life. 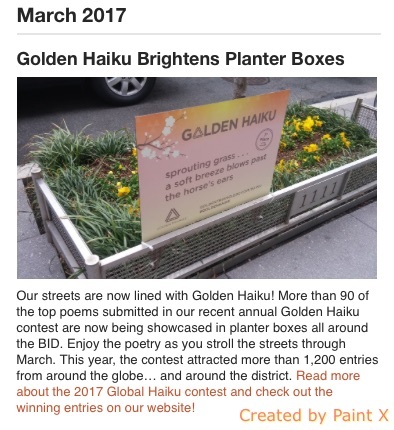 Published in Haibun Today: A Haibun and Tanka-Prose Journal (http://haibuntoday.com/ht111/Articles_Waters_Coats.html), 2/28/17. Published in Wild Plum: A Haiku Journal, issue 3:1, page 46, on 3/1/17. Having a desire to see more poetry in public places is one thing; turning that desire into a reality is quite another. of an overcast day . . .
My posts re. 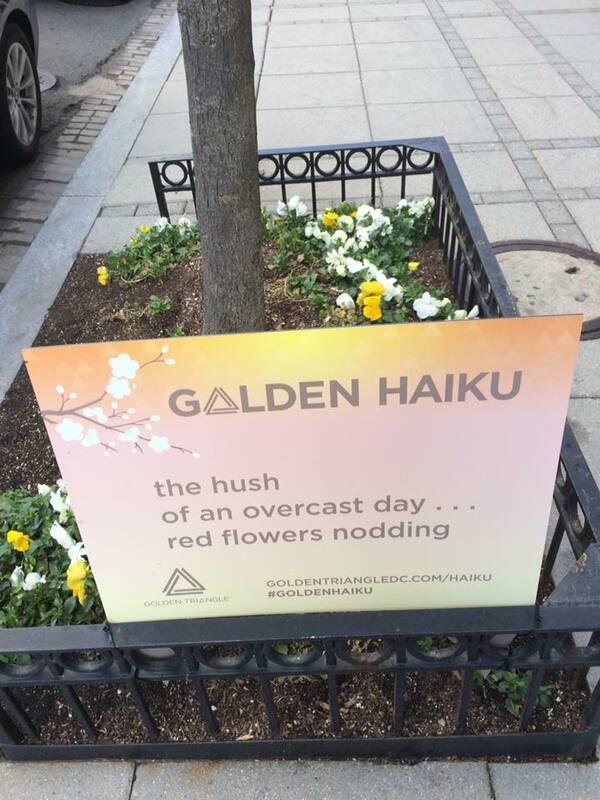 last year’s contest: Golden Haiku Contest 2016 and Golden Haiku Contest 2016 Addendum.